Seattle’s Waterfront has been on people’s mind lately. Between Big Bertha, The Destruction of the Viaduct, and the overall revitalization that the Waterfront is currently undergoing, it’s easy to see why. With all this activity constantly going on, it seems like the Waterfront is in the news every other day. But, Seattle’s Waterfront has been a hotbed of activity for a long time - since the dawn of the city, in fact. In Seattle’s early days, the Waterfront was the center of commerce and the heart of the city, and since the 1960’s, it’s been the center of tourism and excitement for the Emerald City. So, if you’re visiting and you’re looking for a Seattle souvenir as a keepsake of your time spent in the Emerald City, there’s no doubt that the Waterfront is where you should go. Here are the top 5 Seattle Souvenirs to Snag on the Waterfront. If you’re visiting the Seattle Waterfront then you definitely have to hit the aquarium. The Seattle Aquarium is a non-profit organization that’s been around since 1977 mainly focused on education and marine conservation. Each year they help to educate and encourage 800,000 visitors each year, including 50,000 students, to learn about their impacts on marine life. If you’re looking to take some of that knowledge home with you, the Super Shark encyclopedia is a good choice of Seattle souvenir. Featuring in depth info and jaw-dropping facts covering an array of 80 sharks and sea creatures, it’ll leave you chomping at the bit for a return to the aquarium. Most Seattleites, but few tourists, know about Pike Brewing company. Pike Brewing was started in 1989 after founders Charles and Rose Ann Finkel decided to open a brewery celebrating the many different kinds of beers and ales they had enjoyed in their travels across europe. These days, with the craft beer resurgence booming and everybody left and right longing for beers with more flavor than mass produced lagers can provide, Pike Brewing is known as a juggernaut in the west coast craft beer game. Pike Brewing is great because they’re talented and prolific - they have 8 year round beers, and 15 seasonal and limited release beers, all of which are incredibly delicious. If you’re looking to take home some Seattle flavor, this is your best bet. Of course they have beer on tap, but they also sell bottles, cans and yes, growlers, all of which can be neatly packed into your checked luggage bag if you plan to fly! If you truly want a slice of Seattle tourism, you can’t pass up Ye Olde Curiosity shop. We know what you’re thinking: every tourist trap in America has a Ye Olde Curiosity shop. That may be true, but they don’t have one like we have in Seattle. The Seattle Waterfront Curiosity Shop was first established in 1899! Seattle was still very much a pioneer town that was reeling for the effects of the Great Fire just a few years before when founder Joseph Edward Sandley set up shop. These days, Ye Olde Curiosity shop is still known as one of the weirdest places to pick up a Seattle souvenir. But along with novelties and oddities, they also carry a number of products that celebrate the indigenous heritage of the Pacific Northwest, like the Spirt Wolf Totem carved by Rick Williams who is a member of the Nitinant Band Eagle Clan. If you’re looking for a way to celebrate all that Seattle is along with it’s incredibly storied history, it’d be hard to find a better Seattle Souvenir. Ah yes, the quintessential Seattle tourism activity - a visit to Pike Place Market. If you’ve never been, you’ve got to go, and if you have you’re probably already planning your return. You’ve definitely heard about the flying fish, but did you know that the fish can actually fly home with you?! It’s true! Seattle is known for it’s amazing fresh fish, much of which can be purchased at Pike Place, but now the fish market’s are doing their customers one better. 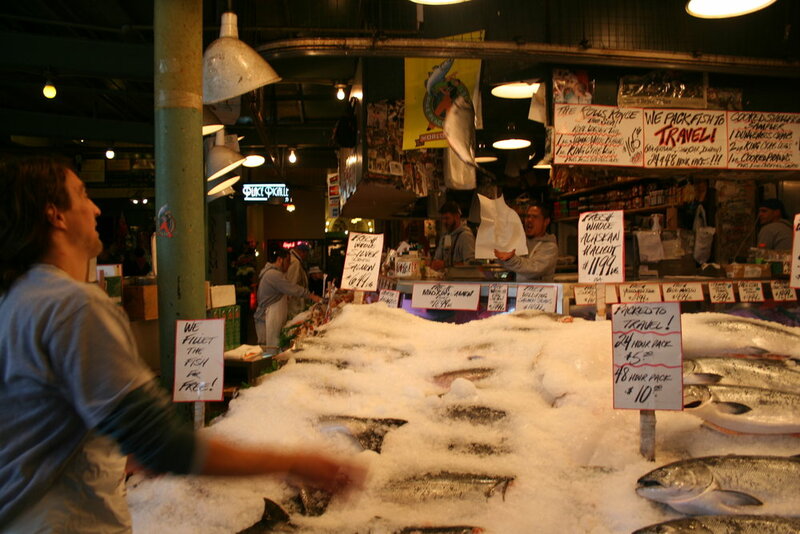 Most of the four fish markets at Pike, including the Pike Place Fish market which is famous for the flying fish, will not only ship their fresh fish to anywhere in the US, they’ll also pack it up for you so you can take it as a carry on if you’re flying out of Seatac. Talk about customer service. Among the Four Fish markets you have access to fresh and smoked salmon and other fish like Alaskan halibut, swordfish and tuna. Crab, shrimp, lobster and shellfish such as oysters, clams and mussels, along with fresh scallops and squid - basically anything you could want! An Epic Seattle T-Shirt from Simply Seattle! Last, but certainly not least, make sure to hip up Simply Seattle on the Waterfront or Downtown at the 1st & Pine store! Simply Seattle is the foremost purveyor of Seattle T-shirts and apparel, and all of their offerings provide a great opportunity to show off your Seattle pride wherever you are. Aside from epic Seattle T-Shirts and apparel celebrating everything from the Emerald City, from the sports teams to the culture and everything in between - Simply Seattle also sells a ton of fantastic Seattle Souvenirs from our new Waterfront Location. If you’re visiting the Seattle waterfront anytime soon and you’d like a keepsake to take home with you, make to visit Simply Seattle. Or, if your trip to the waterfront isn’t happening as soon as you’d like, feel free to visit our online store where you can shop for Seattle Souvenirs to your heart’s content!